The 2019 Great 38 Race Weekend will be the same as 2018's and will feature a 5k, an eight miler, and a half marathon that are certified by the USATF. Routes are are shown below and their routes and certifications (for accurate mile markers) can be downloaded as well. The time limit for the 8 miler is 2:08 and for the half marathon 3:30. Unfortunately, no pets are allowed and strollers are only allowed in the 5k. They start and finish on the campus of the University of Mississippi. 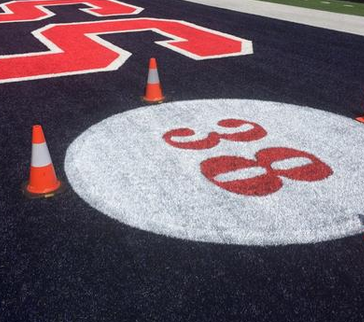 The finish line is the 38 yard line of Vaught-Hemingway Stadium! Click Here for the 5k PDF Download or Click Here for its USATF certification. Click Here for the 8 Miler PDF Download or Click Here for its USATF certification. Click Here for the Half Marathon PDF Download or Click Here for its USATF certification.